TP-LINK's TL-WA890EA didn't make it in on time to be included in our mini-roundup of the Edimax CV-7438nDM and NETGEAR's WNCE3001 N600 bridges. So it's getting its own little review. Like the Edimax and NETGEAR bridges, the TL-WA890EA functions only as a bridge. Unlike the other two, however, it includes a four-port 10/100 switch. Note the micro-USB port on the callout diagram below, which is used to power the bridge. The bridge's quick install guide says you can't power it by connecting to a "nearby device's" USB port. But I did anyway from both a laptop and desktop USB port and didn't have a problem. TP-LINK includes a 5V @ 1A wall-wart supply with USB jack and cable so that you can properly follow instructions. The bridge is very light and tended to get dragged around by its power and Ethernet cables. 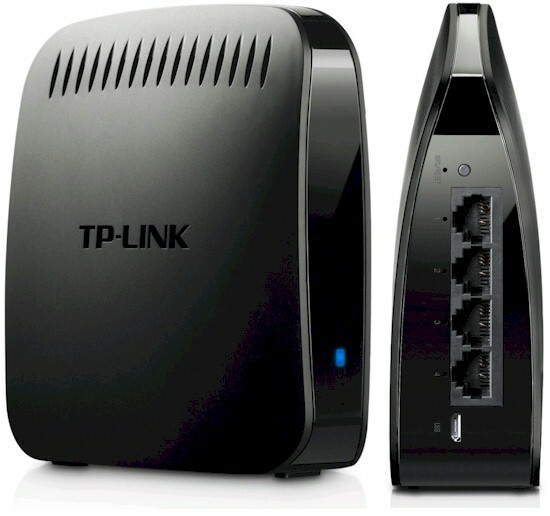 It would have been nice if TP-LINK provided a weighted base. But at least they did include mounting screw slots on the bottom. The FCC ID photo clearly shows the Realtek RTL8196D SoC that serves as the main CPU and switch. The radio device isn't clearly identifiable from the photo, but WikiDevi tags it as the Realtek RTL8192DR, which is also used in the NETGEAR WNCE3001. The design is unique in that it has outboard amplifiers (Skyworks (SiGe) SE5005L) for only 5 GHz. We usually see external amplifiers for neither band or both.